We’d love your help. 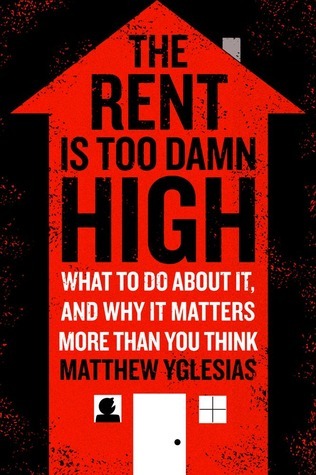 Let us know what’s wrong with this preview of The Rent Is Too Damn High by Matthew Yglesias. Rent is an issue that affects nearly everyone. High rent is a problem for all of us, extending beyo From prominent political thinker and widely followed Slate columnist, a polemic on high rents and housing costs—and how these costs are hollowing out communities, thwarting economic development, and rendering personal success and fulfillment increasingly difficult to achieve. To ask other readers questions about The Rent Is Too Damn High, please sign up. Yglesias makes a convincing argument for a surprising cause of US's worsening economic inequality : Pervasive low-density residential zoning. The US economy is built out of a relatively small number of skilled workers and capitalists earning lots of money, with the rest of the employment in services supporting them (and in services supporting the people supporting them, and so forth.) High density living is prohibited by law in most of the country, so the people working in those support jobs can’ Yglesias makes a convincing argument for a surprising cause of US's worsening economic inequality : Pervasive low-density residential zoning. The US economy is built out of a relatively small number of skilled workers and capitalists earning lots of money, with the rest of the employment in services supporting them (and in services supporting the people supporting them, and so forth.) High density living is prohibited by law in most of the country, so the people working in those support jobs can’t live near the places where it is most profitable to work them. This makes everyone worse off, but the poor most of all. For instance, the tech industry is booming in Silicon Valley, but very few people can benefit from that boom, because very few people can live close enough to benefit from it. This leads to shortages and high prices for essential services. For instance, there are a ton of young professional couples in the valley with young children, yet childcare is expensive and hard to find. This is largely because the people who would provide child care (and would make a comfortable income doing so) can't afford to live in the valley due to its misguided land use restrictions. The most interesting point I picked up from reading this: We as a society just don't know how to think about land use and development. We have the wrong language for it, and incoherent mental models for how things actually work. These misconceptions cause much of the political conflict about it. Misconception: Houses are an investment. A house is a depreciating consumption good like a refrigerator. The land under the house is the investment. Nobody buys a refrigerator expecting to sell it for more than they paid for it. Decoupling these two ideas is essential to understanding these issues. Misconception: There is a natural conflict between homeowners and renters, where renters should naturally prefer higher density, and homeowners should prefer lower density. Both renters and homeowners benefit from higher density zoning, renters because it lowers their rent, homeowners because it increases the value of the land they own. Misconception: Gentrification is caused by development. Gentrification is caused by high demand. High density development is the only thing that can mitigate gentrification. Misconception: High rents are caused by high land prices. As a young person, I'm aware of the implications and difficulties of finding affordable housing in places where people want to live without high other costs. This book makes an compelling argument to ask public officials to rethink public zoning laws and allow more accessibility across the board to affordable housing. The Rent is Too Damn High provides a clear and concise summary of the current housing situation in American cities and how we arrived at this point, Yglesias addresses everything from rent control to public transportation, environmental concerns, and gentrification, and offers a clear vision of how we can move forward on the local and federal levels. Quick and easy to consume, I don't know why anyone WOULDN'T read this. Matt Yglesias is a young journalist, formerly with The Center for American Progress, who is now writing on the economy for Slate magazine. Anyone who has followed his recent reporting or Twitter feed is aware that one recent focus of his work has been the supply-limiting effects of needless regulation, and particularly building and zoning codes. Now, taking his lead from Jimmy McMillan, the recent joke candidate for New York Governor on "The Rent Is Too Damn High" ticket, Yglesias lays out his a Matt Yglesias is a young journalist, formerly with The Center for American Progress, who is now writing on the economy for Slate magazine. Anyone who has followed his recent reporting or Twitter feed is aware that one recent focus of his work has been the supply-limiting effects of needless regulation, and particularly building and zoning codes. Now, taking his lead from Jimmy McMillan, the recent joke candidate for New York Governor on "The Rent Is Too Damn High" ticket, Yglesias lays out his argument for increasing the supply of creating affordable housing in desirable locations by reducing or eliminating zoning and building requirements that distort the market. Yglesias's targets include building height limitations, minimum lot size requirements, and parking requirements that subsidized car ownership. Yglesias argues that not only do these regulations force up housing prices, they also prevent cities from creating the dense, walkable neighborhoods that Boomers and Gen Xers want. A fast, interesting read. One point Yglesias makes that I'd never considered: your primary home is not an investment. If its value goes up, great. You have more money on paper. But unless you plan to move onto the street or live out of your car, you won't realize those gains. At most you'll move to another house, which is also likely to have appreciated in value. The only way you come out ahead is if your property appreciates more than average, which there is no reason to expect. Having read this A fast, interesting read. One point Yglesias makes that I'd never considered: your primary home is not an investment. If its value goes up, great. You have more money on paper. But unless you plan to move onto the street or live out of your car, you won't realize those gains. At most you'll move to another house, which is also likely to have appreciated in value. The only way you come out ahead is if your property appreciates more than average, which there is no reason to expect. I really enjoyed reading this book, as my family and I are currently on the hunt for land and house/s to own, this book is not only relevant to our situation, but many young families in similar circumstances. Australia has similar if not almost the same housing circumstances as the U.S, it's just magnified as the cost of housing and rent doesn't match the average yearly salaries of the middle class. Short book, that had a wealth of knowledge and possible solutions. Great read. Years ago I got obsessed with kindle singles and bought a ton of them. Read a few and got distracted, as always. Now they are super satisfying because I can actually finish them in a short period of time. This one was informative and interesting, especially for someone who has generally lived in very dense cities and very much prefers the urban experience. Yglesias lays out a clear and well supported case for the idea that we could unlock greater shared prosperity by allowing more housing to be built in areas where demand is high. Good primer on zoning reg. A fine way to get interested in the subjects of density, housing affordability, and zoning. Matt needs to update it with more political explanations for why we don't have what he's advocating. The topic of the book, how local government regulation stifles the construction of new homes in opportunity-rich cities across the United States, is vital and pressing, unfortunately something that has been ignored by most politicians. The rent is too high because supply has not coped up with demand. And the supply has been low is not because we don’t have the ability to meet the demand, but because there is no free market in home construction as a huge web of regulations have thwarted builders. The topic of the book, how local government regulation stifles the construction of new homes in opportunity-rich cities across the United States, is vital and pressing, unfortunately something that has been ignored by most politicians. The rent is too high because supply has not coped up with demand. And the supply has been low is not because we don’t have the ability to meet the demand, but because there is no free market in home construction as a huge web of regulations have thwarted builders. It may be surprising for some to learn that in many places, making tall buildings is outright illegal and in others, foolish rules mandating free parking makes them prohibitively expensive to construct. Yglesias touches upon several important topics. One is the confusion among many people about housing prices. House owners feel happy when prices go up and generally, housing is looked upon as an investment. But in reality, this is a mirage as the profits made from a house sale will necessarily have to be used in purchasing another home to live in and so it is a wash. The increasing costs of housing takes a huge chunk of the monthly paycheck of the average American, reducing their quality of life. I would add that house prices should be treated as “inflation” as opposed to treating it as it is the same as a stock price increase so that people get the picture. The author explains the paradox where the cities where the highest incomes can be obtained are the ones that are not growing the fastest, because housing is only available at prohibitive prices, or simply not available. Also, despite improvements in construction technology, we are not utilizing them much such as in making tall buildings because of regulations. In the book, Yglesias also shows how both sides of the political divide have aligned themselves on the wrong side of the debate. The Left has a natural affinity for regulations, aesthetics, and preservation, combined with an instinct against rich developers and fails to see how this is affecting the pockets of middle-class and poor Americans. The Right should be a natural constituency to repeal some of these regulations, unfortunately identity politics has made them align against urbanism and adapt ironically apocalyptic rhetoric against Big Government supposedly forcing rural dwellers to move to the city. The Rent Is Too Damn High: What To Do About It, And Why It Matters More Than You Think does not deserve the disparaging ratings/comments posted on Amazon. It is a fine book written by a market urbanist who explains basic supply and demand very well. "The point is that there are many ways in which expensive land can contain large numbers of people. The question is whether we’ll adopt rules that permit this rather than sticking with rules that often ban row The Rent Is Too Damn High: What To Do About It, And Why It Matters More Than You Think does not deserve the disparaging ratings/comments posted on Amazon. It is a fine book written by a market urbanist who explains basic supply and demand very well. "The point is that there are many ways in which expensive land can contain large numbers of people. The question is whether we’ll adopt rules that permit this rather than sticking with rules that often ban row houses and multifamily structures, generally require low buildings and large amounts of parking, and typically prescribe minimum lawn sizes—even minimum apartment sizes...This directly reduces real wages by increasing the cost of living for people in high-income metro areas. It indirectly reduces real wages by preventing people from migrating to places where job opportunities are most robust...infrastructure improvements can and should be tied to a demonstrated desire to increase population density...Progressives and urbanists need to move beyond their romance with central planning and get over their distaste for business and developers. Conservatives need to take their own ideas about economics more seriously and stop seeing all proposals for change through a lens of paranoia and resentment. Last, politicians of both parties who like to complain about “regulation” and “red tape” ought to spend some time looking at the specific area of the economy where red tape and regulation are most prevalent." Yglesias advocates deregulation of housing and zoning, and even hypothesizes that such regulations are what is contributing to the "Great Stagnation" popularized by Tyler Cowen (my review). He aims to convince Progressives that this deregulation will lower rent in cities, shorten commutes, and improve the standards of living for people in the bottom end of the income spectrum. He criticizes conservatives for hypocritically opposing this deregulation. He explains ideas taught by Adam Smith and David Ricardo very clearly for the lay reader. In a perfect world, Yglesias would be appointed to be HUD commissioner. Alright, sure, I probably like this book a little because I was already inclined to agree with it. But it is a great overview of the current state of ridiculously-priced housing markets, and since I live in one, I'm always on the lookout for a nice, simple introduction to the problem as a way of countering some of the frankly crazy political talking points I see from well-intentioned people around me. The simple fact is, dense cities are good. Good for housing prices, good for developers, good fo Alright, sure, I probably like this book a little because I was already inclined to agree with it. But it is a great overview of the current state of ridiculously-priced housing markets, and since I live in one, I'm always on the lookout for a nice, simple introduction to the problem as a way of countering some of the frankly crazy political talking points I see from well-intentioned people around me. The simple fact is, dense cities are good. Good for housing prices, good for developers, good for renters, good for the environment, good for the poor, the rich, and everyone in between. I suppose it's not as good for apartment managers only too happy to take ridiculous rents for small, crappy apartments. Nor is it good for single-family homeowners near the expanding city who feel they should be able to dictate what the owners of neighboring property can do. But I'll admit my sympathy for both groups isn't particularly high when looking at the real harm that restrictive zoning regulations have on everyone. And it is density that offers a solution to problems of higher rent. As demand grows higher for a supply that legally can't meaningfully increase, we have no simpler, or better, recourse than to challenge the laws and regulations that hold back meaningful development. Rent control is a kiss of death to new development and accelerates urban sprawl, placing more stress on the environment and reducing the virtuous cycle that places service providers near people who can pay top dollar for them. Low-income housing is a worthy goal, but with increased density we can make rents better for literally everyone. If there is any chance of a Progressive-Libertarian fusionism, Matt Yglesias will be its (Progressive) standard-bearer. Imagine an entire book, written by a self-proclaimed leftist, extolling the virtues of urban life, with nary a syllable devoted to using the government to prod people into living life his way? No grand plans. No haughty insults denigrating those who make different lifestyle choices (the wrong "different" lifestyle choices). Just a tightly argued, sensible, thoughtful public pol If there is any chance of a Progressive-Libertarian fusionism, Matt Yglesias will be its (Progressive) standard-bearer. Imagine an entire book, written by a self-proclaimed leftist, extolling the virtues of urban life, with nary a syllable devoted to using the government to prod people into living life his way? No grand plans. No haughty insults denigrating those who make different lifestyle choices (the wrong "different" lifestyle choices). Just a tightly argued, sensible, thoughtful public policy plea, aimed primarily at people of his own political persuasion who, he rightly thinks, tend to adopt a very misguided approach to land use regulation. The basic argument, which could have, and doubtless has, come out of an number of free-market think tanks, is that stifling land use regulation which prevents higher density housing frequently inhibits innovation and prevents the economy from efficiently using resources, resulting in higher housing costs which most harm precisely the people the left claims to care about. That's actually simple Free Markets 101, albeit in a tone more congenial to a progressive audience than anything I've read from the Cato Institute. This book presents some great ideas and greatly changed the way I looked at renting/owning a house or a piece of land. The main idea: to deregulate more and let the free market decide on the rules of urbanisation is very much aligned with my political views and an idea I agree with. Further I realised that I possessed certain misconceptions such as: «The reason house and rent prices are increasing is because this is in the interest of house owners, who will by having a higher demand on houses ge This book presents some great ideas and greatly changed the way I looked at renting/owning a house or a piece of land. The main idea: to deregulate more and let the free market decide on the rules of urbanisation is very much aligned with my political views and an idea I agree with. Further I realised that I possessed certain misconceptions such as: «The reason house and rent prices are increasing is because this is in the interest of house owners, who will by having a higher demand on houses get a better valuation of their property» - this the author argues is short sighted as more density brings with it so many advantages in the long term that the value of the _land_ will increase more. As a dedicated urbanist, I've thought about many of the issues Yglesias covers, yet he digs out so many unexpected observations in 80 pages that I felt I hadn't even started to think or read about the topic. After discussing the many ways in which zoning restrictions (including things that aren't usually considered zoning, like parking requirement) not only inhibit people from living where they want, but force them to move to "cheaper" cities where they, on average, will earn less money. This is As a dedicated urbanist, I've thought about many of the issues Yglesias covers, yet he digs out so many unexpected observations in 80 pages that I felt I hadn't even started to think or read about the topic. This is not an attack on suburbia or a glossy-eyes tribute to urbanity, but rather an insightful treatise on how zoning restrictions hurt people in almost all sectors of the economy and places in the nation. While Yglesias is a self-identified liberal, libertarians and free-market proponents will recognize the logic in his suggestions. The same is true for those who fear gentrification and new development as a tool for displacing the poor. Yglesias notes that without new development, a newly gentrifying area becomes even more expensive, driving out more lower-income people. It's nice to read a liberal blogger who recognizes that rent controls and zoning restrictions reduce the standards of living for the poor and middle class, but at times the book seemed a little too conclusory, just repeating this message over and over again. I loved his idea that zoning restrictions on buildings' heights and occupancies actually help create the sprawl that progressives are so against: neighborhoods that are in desirable locations close to city centers that would otherwise be pop It's nice to read a liberal blogger who recognizes that rent controls and zoning restrictions reduce the standards of living for the poor and middle class, but at times the book seemed a little too conclusory, just repeating this message over and over again. A short (< 100 pages) description of housing problems in America and a libertarian argument about what to do about it. A couple of years ago, this would be released with a two-word title and an all-white cover and would be twice as long. The book argues that misguided rent control laws and zoning restrictions are a big part of the problem. The well-disciplined conservative movement in this country should be able to change that but public policy and public preferences favor a fetish for suburb A short (< 100 pages) description of housing problems in America and a libertarian argument about what to do about it. A couple of years ago, this would be released with a two-word title and an all-white cover and would be twice as long. This short e-book did a great job bringing together some of the development issues that prevent cities from building housing efficiently. NIMBYism, zoning, parking requirements all slow down growth in city housing and thus inflate the costs of living in a city. His thesis is that cities are more productive places to live so the US would be better off economically if more people lived in them versus following cheap housing opportunities which usually are in less productive places. He touches on a This short e-book did a great job bringing together some of the development issues that prevent cities from building housing efficiently. NIMBYism, zoning, parking requirements all slow down growth in city housing and thus inflate the costs of living in a city. His thesis is that cities are more productive places to live so the US would be better off economically if more people lived in them versus following cheap housing opportunities which usually are in less productive places. Really great. I'm a huge fan of Yglesias's writing in general, and I think he here outlines his arguments about growth in a clear and persuasive way. It's not that everyone needs to live in enormous apartment skyscrapers, it's just that existing residents of a neighborhood should not be able to make denser living impossible -- if they are able to block development, there are benefits to those residents (though also higher rents) but also costs for society as a whole, as I think Yglesias effectiv Really great. I'm a huge fan of Yglesias's writing in general, and I think he here outlines his arguments about growth in a clear and persuasive way. It's not that everyone needs to live in enormous apartment skyscrapers, it's just that existing residents of a neighborhood should not be able to make denser living impossible -- if they are able to block development, there are benefits to those residents (though also higher rents) but also costs for society as a whole, as I think Yglesias effectively argues.